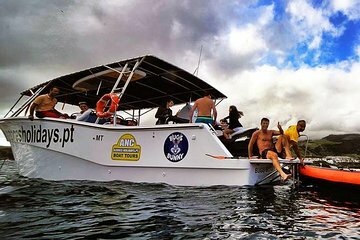 Make the most of your vacation time with this boat tour of the São Miguel coast near Ponta Delgada. In a few hours, travel along the coast as far as the Vila Franca do Campo Islet and back, passing São Roque and Caloura along the way. Keep your cameras handy for beautiful views of the island and beaches, spot dolphins and other sea life, and try out kayaks, stand-up paddle boards, and snorkeling gear. Note: The date of the tour can be changed depending on weather conditions, at no cost to the customer. The pricing is per person. The minimum number of people to start a tour: 6 Adults.